There are a number of national symbols of Moldova, representing Moldova or its people in either official or unofficial capacities. (Romanian: Drapelul de Stat al Republicii Moldova) is a rectangular cloth, equally vertically tripartite, starting from the flag pole in blue, yellow and red, similar to the flag of Romania. The difference is the State Emblem of the Republic of Moldova disposed in the midst of the yellow field, constituting 1/5 the length of the flag. 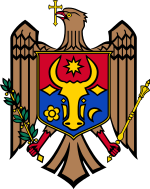 (Romanian: Stema de Stat a Republicii Moldova) is a horizontally divided shield having in the upper part red chromatics, in the lower part – blue, loaded with the head of aurochs having between its horns a star with eight rays. The head of aurochs is flanked on the right by a five-petalled rose, and on the left by a crescent. The aurochs is also present on the coat of arms of Romania. All the elements present on the shield are of golden. The shield is placed on the breast of a natural eagle holding in its beak a golden cross and taking in the right claw a green olive branch, and in the left claw a golden scepter. It was written by Alexei Mateevici in 1917, one year before the union of Bessarabia with Romania. The music for the anthem was composed by Alexandru Cristea. Between 1917–18 and 1991–94, the national anthem of Moldova was Deșteaptă-te, române!, which is also the national anthem of Romania. It commemorates the adoption of the Declaration of Independence from the Soviet Union on 27 August 1991. The act of independence was officially recognized on March 2, 1992, when Moldova gained membership of the United Nations. Being a public holiday most people and employees, also most retail businesses and public institutions are closed on this day. It forms the western border of Moldova with Romania. begins on 1 March and lasts 10 days, symbolizing the coming of spring. is celebrated the Monday after Thomas Sunday. ^ "Drapelul de Stat al Republicii Moldova". Presidency of the Republic of Moldova (in Romanian). ^ "Stema de Stat a Republicii Moldova". Presidency of the Republic of Moldova (in Romanian). 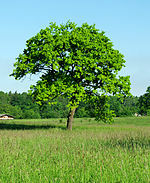 ^ [http://aglobalworld.com/holidays-around-the-world/moldova-independence-day/ Moldova celebrates Independence Day.